Two levels are better than one, and currently Grand Forks is the only large club in the state without a second level viewing area. Fans of curling understand that viewing from above is an ideal position for watching incoming shots and following strategy. Many clubs have video cameras positioned to offer this perspective but looking at a monitor is nothing like looking down at four sheets of ice. Adding a second level will also give us twice the viewing seats and twice the space to host events both competitive bonspiels and community events. Our youth program has been growing every year over the past several years. The youth are featured in the Park Board activities booklet and kids with no prior experience come to the club and learn the basics of curling. Many youth have really taken to our challenging sport and return every year. Previously, we had limited space, and there was no place that our youth could call their own. Finally it's clear that young people have a place in the future of our club and they are always welcome. If you've ever been to the club and had to use the bathroom, you know that our bathrooms were small and in need of updates. During busy bonspiels our bathrooms were simply not enough for everyone. In the new club we will have a total of four bathrooms, two on each floor, and the main floor bathrooms will include locker rooms. They will also be handicap accessible, something our old club was lacking. The addition of an open air balcony is very unique. Both seasoned curlers and new players are excited about this feature. 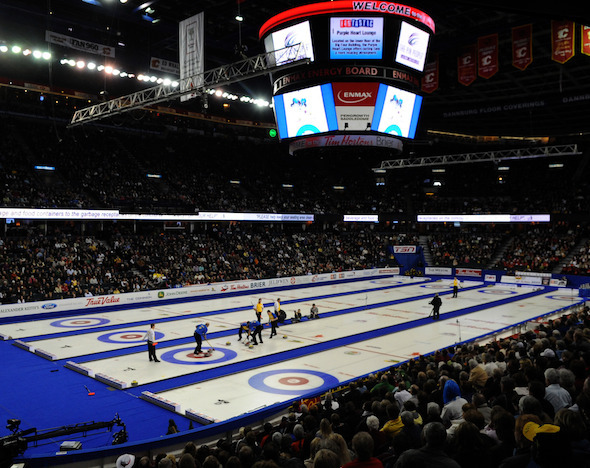 Curlers can sit out on the ice and watch a game from above. It gives a more "arena feel" to watching the game and you can closely follow the action by hearing skips call shots. This is an excellent spot to watch and learn about the game of curling. Space in the ice arena was quite cramped and there was no place to store equipment or tools. The ice scraper was kept to one side of the ice and its handles actually extended over our playing surface. There was no space for new equipment. Now there will be a large storage area where we can store our ice making supplies and keep our arena clear for events and leagues. Sponsors are an important part of the curling club because money from advertisements helps keep membership fees affordable. Some of our wall sponsors have supported us for decades, and a few painted signs outlasted the businesses themselves! Space in our old facility was limited, however, and we try to accommodate all interested sponsors. With two stories to fill, we will have many more advertising opportunities for community businesses. These are only a few exciting opportunities. There are many more which you can see in this video tour. It was created by the architects who designed our new building and highlights some key features. We are very excited to start curling this season under a new roof and inside new walls. Come join us in the fall for one of our learn to curl sessions, or sign up for a winter league!